On April 29, 1965 William Branham was preaching in Los Angeles and prophesied that the city of Los Angeles would one day slide into the sea, just like Capernaum, and that a new coastline would form at the Salton Sea. 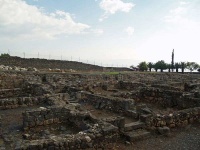 However, Capernaum never sank into the Sea of Galilee, but remains in ruins on its shoreline. In the book "Acts of the Prophet" by Pearry Green, William Branham told his son Billy Paul that sharks would swim in downtown Los Angeles before he was an old man. Billy Paul was born in 1935 and should be considered a man in his senior years by now. Why does William Branham compare the sinking of Los Angeles to the sinking of Capernaum when, in fact Capernaum did not sink? In actuality, Capernaum was simply abandoned, and its ruins are on the shore of the sea of Galilee to this day. We know because we've been to Capernaum. The ruins are still there. In 1965, while relating a story about the Alaska earthquake, William Branham stated that Los Angeles would sink shortly thereafter - In a few days a great earthquake's going to strike on the west. And it won't stop. California, Los Angeles will sink. It's going down. Note that this certainly seems like a failed prophesy. He said that the Alaska earthquake in 1964 was going to be the start of a series of earthquakes culminating with Los Angeles sinking. But nothing of significance followed the Alaskan earthquake in the United States. Why? Pearry Green wrote the following on page 119 of his book "Acts Of The Prophet", with regards to a statement William Branham made to his son, Billy Paul: "Billy, I may not be here but you won't be an old man until sharks will swim right where we are standing." While Billy Paul is alive today, his birthday is September 13, 1935 (i.e., he turned 80 years old in 2015). Signal Hill, May 1, 1923: Unregulated oil extraction honeycombing the oilsands under Signal Hill. The concept of a great earthquake in California and part of it sliding into the ocean was not a new concept initiated by Brother Branham. The risk of LA sinking was well known and discussed in scientific and popular culture, as evidenced by the April 1, 1957 issue of Time Magazine that reported a partial sinking of Long Beach. This sinking was blamed on the excessive oil drilling in the area. It is also well known that Los Angeles lies on the 'ocean-side' of the San Andreas Fault. In this regard, the sinking of Los Angeles may still happen, as the instability of the land was well know and documented before William Branham's prophecy. Combined with the danger of existing fault lines that Los Angeles sits on, the potential for a devastating natural disaster is scientifically plausible. Since the 1950's, oil producers have been pumping water into the earth to replace the oil they extract in order to stop the land from sinking. The only problem with this process is that water has different properties than oil, as residents of Daisetta, Texas learned in 2008 when the walls of an underground salt-cave (from which oil brine had been extracted) dissolved, creating a sink-hole 900 feet wide by 260 feet deep. 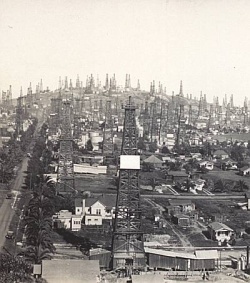 Between 1932 and 1960 iodine was harvested from oil brine extracted in the Los Angeles basin - raising the question of whether the water being pumped into the earth is currently dissolving structural minerals under Los Angeles. Pearry Green's Church also distributes the prophecy of Joe Brandt as proof that California will soon sink. We looked into this and found that a man named Joe Brandt gave a stack of old papers containing a prophecy he claimed to have written 1937 to Jessica Madigan on December 25, 1965, the date of William Branham's death. Jessica Madigan published a series of dreams and visions in a book called "Prophecies of Tomorrow" in 1966. Living Waters magazine then reproduced this prophecy in June 1969. William Branham would therefore have been unaware of this prophecy, which is much more specific in its details. What is interesting is that this 'prophecy' did not appear in 1937 when it was supposedly written. If you had a vision of catastrophic proportions, wouldn't you try to warn someone as soon as possible rather than waiting 30 years? The Biltmore Hotel, Downtown Los Angeles, where William Branham prophecied that Los Angeles would roll into the sea. "Oh, Capernaum," said Jesus, "thou who exalted into heaven, will be brought down into hell. For, if the mighty works had been done in Sodom and Gomorrah, it'd have been standing to this day." And Sodom, Gomorrah lays in the bottom of the Dead Sea. And Capernaum is in the bottom of the sea. We find ourselves at this Christmas, just about like they did the first Christmas though. The world's just about to fall apart, as I preached on once somewhere, about a Christmas message, "The World Falling Apart." And the world again is just about to come to pieces. Look at the earthquakes over here in California. I predict before the coming of the Lord Jesus, that God will sink that place. I believe that Hollywood, and Los Angeles, and them filthy places over there, that God Almighty will sink them. They'll go beneath the bottom of the sea. And it's so much sin (You see? ), it's the barrier. Civilization has traveled with the sun, from... And it started in the east going west. And now it's at the west coast. If it goes any further, it'll be back east again. So that's the barrier. And sin has traveled with civilization, and it becomes the cesspool of all ages. Things they do that--that human beings in any other age wouldn't have thought of such a thing. Women has throwed theirself to such a filth, till no woman in any age would've ever thought of such a thing as we do today. And then still call ourselves Christians. What a disgrace." Since that earthquake, there is a two or three-inch crack that come in the earth, starting in Alaska, goes around through the Aleutian Islands, comes out about a hundred and fifty or two hundred miles in the sea, comes back up at San Diego; takes in California, or Los Angeles, and comes out again just below the northern part of California there, a little place called San Jose, just below there. And this scientist was speaking, being on a interview. We was watching on television. And he said, "Beneath that is just a churning lava." And he said this; he said, "That is... A chunk will break loose," and said, "and it will..." And this inter--man on--scientist interviewing this chief scientist, said to him, said, "Well, that could then all sink?" He said, "Could? It's got to." Said, "Well, 'course, will probably be many, many years from now." He said, "It can be in five minutes from now, or it can be in five years from now." He just 'lotted five years. But just as I surely was standing there under that Inspiration, put judgment on that west coast, and then followed it right up here with the sinking of Los Angeles; she's gone! That's right. And, of course, the Salton Sea is about two hundred feet below sea level, and if that big churning, that earth swallowing in like that, with hundreds of square miles, hundreds and hundreds of square miles sinking into the earth, that'll throw a tidal wave plumb to Arizona. Everybody running, and trying to get under trucks and everything else. It went back up again and clapped like a great thunder, went back up in the skies again, and come down again, and done that three times. And when it was all over, they come over and asked, "What did it mean?" I said, "I don't want to tell you, it was a judgment sign. In a few days a great earthquake's going to strike on the west. And it won't stop. California, Los Angeles will sink. It's going down. It'll slide right into the ocean." And two days after that, the Alaskan earthquake shook Alaska. And then, the last meeting I had in California, while speaking, and didn't know nothing happened till I got on the street, It told California, said--said, "Capernaum, Capernaum, the city that's called by the name of the angels (that's Los Angeles), you've exalted yourself into heaven, but you'll be brought down into hell. For if the mighty works had been done in Sodom that's been done in you, it would've been standing till this day." Now, the last few days, the great roaring and popping. Look here! Do you know what the Lord says about Los Angeles and these places here? "She's gone!" You remember what I told you, about two years ago, how that earthquake would come in Canada up here, Alaska? I also tell you that "Hollywood and Los Angeles is sliding into the ocean. California, you're doomed! Not only California; but you, world, you're doomed! Church, unless you get right with God, you're doomed!" THUS SAITH THE HOLY SPIRIT! Have you ever heard me use that Name unless it come to pass? Ask you! You've known me twenty years. Did I ever tell you anything in the Name of the Lord but what come to pass? If everything I've ever told you would happen, happened, say "Amen." [Congregation says, "Amen!"--Ed.] See? I tell you, now is the hour, you better be getting right, all of us. This page was last edited on 31 July 2016, at 16:52.